A Rhone Valley vintner, Laurent Habrard, located in Crozes-Hermitage, turned Internet as a major toll for reducing his carbon print and attracting customers through his web site. Habrard is a fourth generation vintner on this vineyard and decided in 2008 to reduce the carbon print of his vineyard by conserving rain water, isolating the buildings for energy conservation, using wind and sun power as electricity sources and cutting back on carbon dioxide emissions. 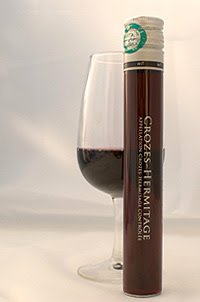 Considering it’s cheaper and ecologically better to send samples by mail (since the mail person comes by his property 6 times a week) to potential clients, he created, with the help from the Arts et Métiers engineering school in Paris and the INRA agricultural research institute of Montpellier tubes speially designed to help samples of his wines: Crozes-Hermitage Red and White 2006, Hermitage white 2006, Saint-Joseph rouge 2006 and Vin de Pays rosé 2006. Customers can order 3 samples maximum for the modest cost of 6,90 euros. This strategy is very innovative – especially coming from a “small” vintner. In our lean times, it’s a very astute idea to attract customers from all over France who might not have access to his wines or don’t feel like traveling to Crozes-Hermitage. The customers won’t lose any time or any money, since the 6,90 euros will be deducted from the coming order. The site itself is very well done with videos of a sommelier presenting each wine, videos of the property and a good design and ergonomy. An enjoyable virtual visit you can top up with a tasting of the samples – as if you were visiting the estate! Good work! Previous post: Wine blogs in France? Next post: Why should a winery design a new web site?